Stainless steel plate is a generic term and acid steel. Resistant stainless steel plate refers to air, water, steam and other weak medium corrosion of steel and acid-resistant steel refers to acid, alkali, salt and other chemical etching medium corrosion of steel. By organizational structure is divided into martensitic stainless steel (including precipitation hardening stainless steel), ferritic stainless steel, austenitic stainless steel and austenitic plus ferritic duplex stainless steel and other four major categories? By steel major chemical composition of the steel sheet or some characteristic elements classified into chromium stainless steel, chrome-nickel stainless steel, chromium-nickel-molybdenum stainless steel and carbon steel plate, high molybdenum stainless steel plate, stainless steel and other high purity.Press the performance characteristics and uses of steel classified into nitric acid-resistant stainless steel plate, acid-resistant stainless steel plate, stainless steel pitting corrosion, stress corrosion of stainless steel plate, high-strength stainless steel panels. Press features steel classified into low-temperature stainless steel, non-magnetic stainless steel plate, cutting stainless steel plates, stainless steel and other superplasticity. Stainless steel plate manufacturing method are two hot and cold, including 72 938 mm thickness 0.5.10-885 thin cold and 4.5-100 mm plate.Is required to stand oxalic acid, sulfuric acid - ferric nitrate, nitric acid - hydrofluoric acid, sulfuric acid - copper sulfate, phosphoric acid, formic acid, acetic acid and other corrosive, widely used in chemical, food, pharmaceutical, paper, oil, atomic energy, etc. industry and construction, kitchen utensils, dishes, vehicles, household appliances, all kinds of parts. In order to ensure the yield strength of stainless steel plate, the mechanical properties of tensile strength, elongation and hardness to meet the requirements, must be annealed, solution treatment, aging heat treatment before delivery, steel 05.10 88.57.29.38 special symbols.The corrosion resistance of stainless steel mainly depends on its alloy composition (chromium, nickel, titanium, silicon, aluminum, manganese, etc.) and the internal organizational structure.Method points in two hot and cold, according to the organizational characteristics steel is divided into five categories: austenitic, austenitic - ferritic, ferritic, martensitic, precipitation hardening. 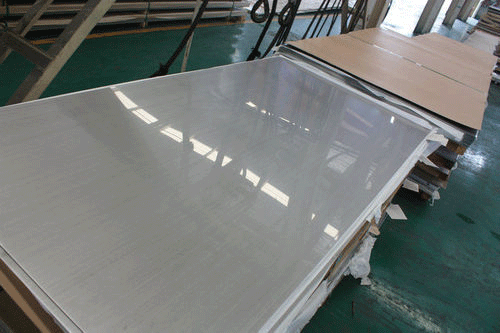 Stainless steel plate surface finish, higher corrosion ductility, toughness and mechanical strength, acid and alkaline gases, solvents and other media. It is a rusty steel is not easy, but not definitely not rust.